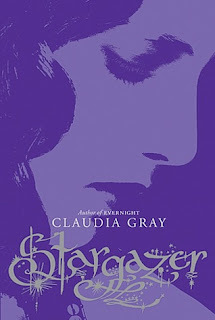 After reading Evernight, I was dying to start Stargazer to know what happened between Bianca and Lucas. I mean, their relationship is total Romeo and Juliet "my family wants to kill you, and your family wants to kill me." Coming home for the holidays might be a little tense, don't you think? Lucas and Bianca together are totally swoon-worthy. Hell, Lucas himself is swoon-worthy. He's protective of her, and despite the fact that she's a vampire, he still loves her. But, Lucas isn't the only boy in Bianca's life... we see a bit more of Balthazar, a fellow vampire. I really, really like Balthazar, and even though not much has happened between him and Bianca yet, I can definitely sense that I will most likely be Team Balthazar soon. If you thought the twist in Evernight was intense, Claudia Gray manages to up the stakes even more! We're not just dealing with vampires and vampire hunters anymore. Now something much darker and deadlier has been added into the mix... and it wants Bianca. Totally recommended if you loved Evernight, or even if you were so/so on it. There's more suspense, more action, lots more Lucas action, so pick it up! 4 out of 5 stars.